Blackley belatedly got off the mark for the season in a rain-hit Spenser Wilson Halifax League programme yesterday. They chased down a reduced target of 143 at home to Northowram Hedge Top to join their visitors on 46 points but the pair share bottom spot after lowly Thornton and Mytholmroyd also won. Tom Clee, back at Northowram this season, had a fine game in hitting 66 runs and taking four for 59. However, Hedge Top’s 255 for nine, which also included 43 from Razwan Saghir, was shrunk to 142 and Blackley grabbed their chance. Their prospects were not looking bright at 45 for four but Freddie Fox (43) and Dominic Walsh (42) saw them to a three-wicket victory in the 25th over. Thornton beat visitors Jer Lane, who clung on to top spot because they collected the same four points as chasing trio Warley, Triangle and Booth, who were all thwarted by the weather. Ex-Thornton player Wayne Cotton made 56 on his return to the Hill Top ground and Nasir Chowdrey (50) and Imran Mirza (48) also contributed well as Lane made 219 for seven. Thornton were left requiring 177 off reduced overs and Greg Soames (75), Mick Shanks (37 no) and Nikki Hutchinson (36) sealed a six-wicket success. Mytholmroyd continue to gather momentum after a slow start, blitzing Sowerby Bridge by nine wickets at Stainland after dismissing their opponents for 59. The match between the second and fourth teams, Warley and Booth, was unable to start while only 32 overs were possible at Triangle. The third-placed hosts had powered to 256 for three against Copley with Christian Silkstone gaining fluency to make 103 not out and Jack Gledhill a polished 59 not out, the pair adding 138. There was a second top section washout at SBCI, where Sowerby St Peter’s were the other frustrated team. 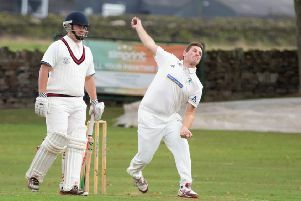 Oxenhope are the new leaders in Division One after winning the section’s only completed game, at Great Horton PC. Robin Cusdin’s fine bowling was decisive, the visitor’s six for 33 included a hat-trick as Horton slipped from 67 for three to 67 for seven. Needing 130, Oxenhope wrapped up a five-wicket win to leapfrog Bridgeholme and Queensbury. Former leaders Queensbury made 207 for five at home to Southowram, with 74 from Scott Osbourne and 46 from opener Jamie Priestley, before play was ended. Bridgeholme were unable to take to the field at Old Crossleyans’ Broomfield ground while the Stones versus Low Moor contest also failed to get under way. Division Two produced two results with Cullingworth victors on their visit to Upper Hopton, where they successfully defended a 216 for nine total to win by 12 runs. Denholme Clough stayed second place with a far easier win at third-placed Shelf, for whom Leigh Butterfield’s 64 included 10 sixes. Outlane’s Andrew Holding made 56 in his side’s 256 for nine at Bradshaw, for whom evergreeen Andy Ingham took five for 79. Bottom club Greetland must have fancied their chancesd of success at Old Town before the weather intervened. Town made 115 and Greetland had reached 15 without loss in pursuit when the rains came. Premier Division: Northowram HT 255-9 adj to 142 (Clee 66, Saghir 43, White 3-40, Pedley 3-60), *Blackley 143-7 (Fox 43, Walsh 42, Clee 4-59): pts 5-11. *Sowerby Bridge 58, Mytholmroyd 60-1: pts 0-12. *SBCI v Sowerby St Peter’s - no play: pts 4-4. Jer Lane 219-7 adj to 176 (Cotton 56, Chowdrey 50, Mirza 48), *Thornton 180-4 (G Soames 75, Shanks 37*, N Hutchinson 36,Yeadon 3-33): pts 4-11. *Triangle 256-3 (Silkstone 103*, Gledhill 59*, Fryer 46, Madden 34), Copley dnb - rsp: pts 4-4. *Warley v Booth no play: pts 4-4. Division One: *Great Horton PC 129 (Ilyas 30, Cusdin 6-33 inc hat-trick), Oxenhope 132-5 (Jackson 36,Hopkinson 35*): pts 2-12. *Old Crossleyans v Bridgeholme - no play: pts 4-4. *Queensbury 207-5, Southowram dnb - rsp: pts 4-4. *Stones v Low Moor HT - no play: pts 4-4. Division Two: Outlane 256-9 (Holding 56, Davies 46, Mellor 45, Ingham 5-79, Firth 4-82), *Bradshaw dnb - rsp: pts 4-4. *Luddenden Foot v Clayton - no play: pts 4-4. *Old Town 115-9 (Raphael 32, Malik 4-40), Greetland 15-0 - rsp: pts 4-4. Denholme Clough 265-9, *Shelf 199 (Butterfield 64, SH Ali 31, W Ali 4-47, Aslam 3-33): pts 12-5. Cullingworth 216-9, *Upper Hopton 204-6: pts 10-5.